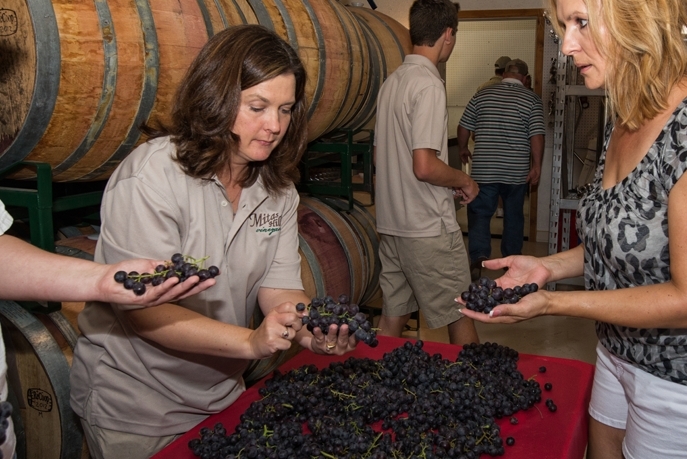 The Mitas family’s passion for creating exquisite Texas wines is evident in The Winery at Mitas Hill. The family spent considerable time planning The Winery; it’s designed for perfection and equipped with state-of-the-art winemaking vessels and laboratory equipment. The new Winery at Mitas Hill is capable of producing 15,000+ gallons annually – all handcrafted with the utmost care and attention to detail. One of the many unique characteristics of The Winery at Mitas Hill is a wine cellar known as The Caves. The Caves were created by crews who literally dug the structure into the natural hill. The 2,400-square-foot wine cellar houses oak barrels and stainless steel vats where Mitas Hill wine is aged. The Wine Bar is the perfect place to enjoy a glass of Mitas Hill Wine with one of our hand crafted pizzas baked in our wood burning oven or other light bites designed specifically to compliment our wines.